It sure seems like during the holidays we take way more photos than normal, so we end up with lots of photos to scrapbook. To get your holiday pages done, simple but elegant pages like this offer a quick and easy solution. Using neutrals as a base and a few key colors you can unify multiple layouts and save on supplies. Here Crumb Cake, Early Espresso and Cherry Cobbler are paired for a classic holiday look. Using direct to paper method drag Crumb Cake Classic Ink on paper to texturize, and ink the edges. Cut Early Espresso Card Stock to 7.5 x 10 and attach to cardstock with SNAIL. Cut a 3 x 12 strip of Designer Series Paper, and then run Cherry Cobbler piece through Big Shot with Tasteful Trim die to create scallop edge. Attach scallop edge to back of patterned paper with SNAIL, and then attach entire panel to page. Run Early Espresso ribbon along seem between trim and patterned paper, attach with SNAIL and trim off edges. Cut letters for title – JOY – out of Early Espresso using the Big Shot and the Serif Essentials Alphabet. Attach to page base. Top off letter O with a bow out of Cherry Cobbler Seam Binding and a Basic Pearl. Get started today on those holiday pages, and try to find a way to unify them with colors and similar products to help save valuable time. 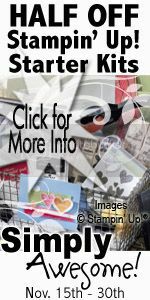 To shop for scrapbooking supplies, visit my online store and shop 24/7 in your PJs!